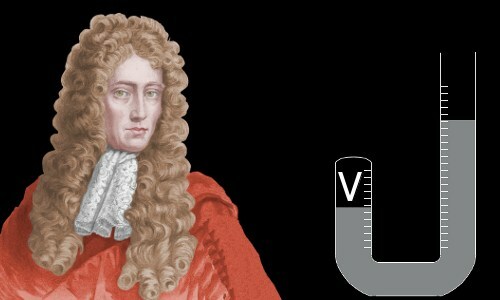 Robert Boyle put chemistry on a firm scientific footing, transforming it from a field bogged down in alchemy and mysticism into one based on measurement. He defined elements, compounds, and mixtures, and he coined the new term ‘chemical analysis,’ a field in which he made several powerful contributions. He discovered Boyle’s Law – the first of the gas laws – relating the pressure of a gas to its volume; he established that electrical forces are transmitted through a vacuum, but sound is not; and he also stated that the movement of particles is responsible for heat. He was the first person to write specific experimental guidance for other scientists, telling them the importance of achieving reliable, repeatable results. Robert Boyle was born into an aristocratic family on January 25, 1627 in Lismore Castle, in the small town of Lismore, Ireland. His father was Richard Boyle, who had arrived from England in 1588 with a modest sum of money. Through a good marriage and a high level of business acumen he had grown immensely wealthy and become a large-scale landowner. With land ownership came the aristocratic title Earl of Cork. The land he bought had been confiscated from rebellious Irish noblemen and commoners by the army of Queen Elizabeth I of England, who was also Queen of Ireland. Robert’s mother was Catherine Fenton, born in Ireland to a wealthy English family. Her father became Secretary of State in Ireland. Robert was his parents’ fourteenth child. In his infancy he was sent to live with a poor Irish family. His father preferred his children to spend their early years this way, believing it toughened them up. Robert developed a stutter in this time. Robert’s mother died when he was just two years old, and he never knew her. Some time after his mother’s death he returned to the family home, where he was tutored in French and Latin. He particularly enjoyed learning French. At the age of eight, Robert was sent to England’s most prestigious private school, Eton College; he spent three years there. At the age of 12 he embarked on a lengthy tour of Europe with his older brother, Francis, and a tutor. This ‘Grand Tour’ was a traditional part of many wealthy people’s education, often including visits to the great classical sites of Italy and Greece. In fact, Robert spent much of his time in the Swiss city of Geneva. He traveled to Italy at the age of 14, learning there how Galileo Galilei had used mathematics to explain motion. Robert was thrilled by this and began studying Galileo’s work, presumably smuggled in from Switzerland, because it had been banned in Italy. Galileo was in the final year of his life when Robert arrived in the great Italian city of Florence. Galileo lived close to Florence under house arrest; he died while Robert was in Florence. 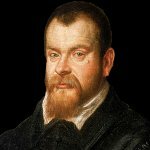 Robert approved of the idea promoted by Galileo and Nicolaus Copernicus that the earth and other planets orbit the sun. The young Robert Boyle was fascinated by Galileo’s belief that mathematics is the language of the world around us. 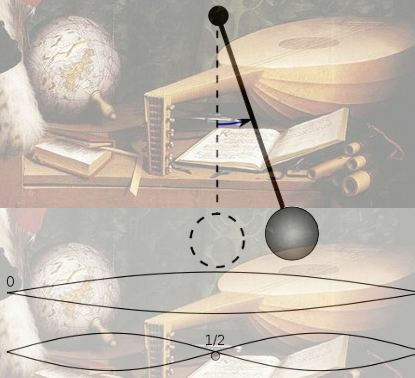 The behavior of planets and pendulums, and the fundamentals of music and mechanics, could all be understood using mathematics. While Robert was on his Grand Tour, his father died, leaving him a large country house near the English town of Stalbridge, plus large estates in Ireland. In 1644, aged 17, Robert returned to England, staying for some months with his older sister Katherine in London. He then moved to his Stalbridge country house. All was not plain sailing, however, because in 1644 England was in the middle of a civil war caused by a power struggle between Parliament and the King. Robert Boyle had no intention of getting involved in the war. He took a cautious approach, so that neither of the warring sides could see him as an enemy. He did not approve of the behavior of soldiers. A deeply religious young man, he was worried that involvement in military activities would corrupt him. The country home near Stalbridge that Robert Boyle inherited from his father. In fact, while war raged in England, Boyle spent time writing his first book. It concerned morality and was entitled Aretology. He became increasingly interested in carrying out scientific experiments and studying scientific literature. He equipped a laboratory in 1646/7 and also began traveling to London for meetings with the ‘Philosophical College,’ a group dedicated to experimental science and the exchange of scientific ideas. Boyle lived in an extraordinarily superstitious age. The Enlightenment – the triumph of reason over superstition – that transformed much of Europe in the 1700s was still a long way off. In Boyle’s time people lived in terror of (non-existent) witches and (all too real) witchfinders. Between 1644 and 1647 over 300 women in eastern England were killed for supposedly being witches after their ‘discovery’ by the notorious, self-appointed Witchfinder General, Matthew Hopkins. England was also becoming increasingly puritanical: Parliament banned the celebration of Christmas in 1647, the ban remaining in place until 1660. Boyle returned to his estates in Ireland in 1652, aged 25. He stayed there for two years, but grew increasingly unhappy in an environment he saw as unfavorable to his development as a scientist. He also suffered a serious illness, permanently affecting his eyesight. For the rest of his life he could read only very slowly and he had to employ people to do his writing for him. In 1654 or 1655, aged 27/28, Boyle moved to the university town of Oxford, England. There he hoped to find a scientifically productive environment. He rented rooms and set up a laboratory. He never officially joined the university; he was so wealthy that he needed neither salary nor funding for his experimental work. In 1655 he had the good fortune to meet Robert Hooke, a young university student. Hooke’s extraordinary abilities with mechanical equipment impressed Boyle, who began paying him to work as his laboratory assistant. In 1654 Otto von Guericke had invented the vacuum pump. Boyle learned of this in 1657 and was intrigued. He discussed the concept of a vacuum pump with Hooke, who was able to improve on von Guericke’s design. Using Hooke’s pump Boyle and Hooke carried out experiments investigating the properties of air and the vacuum. While experimenting with air, Boyle and Hooke made their first great discovery, now called Boyle’s Law. They made their discovery using a glass tube similar to the one shown at the top of this page. Inside the tube, they used mercury to vary the pressure on a fixed weight of air. Boyle discovered that pressure multiplied by volume is a constant. In other words, when you increase the pressure on a gas, the gas’s volume shrinks in a predictable way. This was the first gas law to be discovered. Over a hundred years were to pass before the next gas law, Charles’ Law, was discovered in 1787. A graph of Boyle’s actual experimental results. 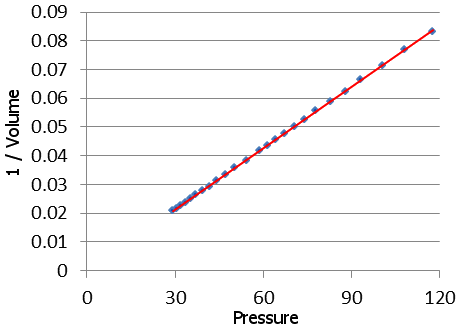 Reciprocal Volume is plotted vs. Pressure, producing a straight line. The data for the graph are taken from Boyle’s work: A Defence of the Doctrine Touching the Spring And Weight of the Air. Boyle published this result in 1662. With its publication he emulated his hero Galileo for the first time. Galileo firmly believed that the world could be explained using mathematics – as indeed Pythagoras had in a much earlier age. Boyle had now shown by experiment that air follows mathematical laws. Boyle and Hooke’s vacuum pump. Boyle discovered sound cannot travel through a vacuum. He did this by ringing a bell housed inside a 28 liter glass jar. The bell was rung with the help of a magnet outside the jar. As he pumped air out of the jar, the sound of the bell grew fainter and fainter. The vacuum pump is shown on the left. By turning the handle at the bottom, Boyle or Hooke could pump air out of the glass jar at the top. Obviously, in performing this experiment, Boyle also showed that magnetic forces can travel through a vacuum – otherwise he could not have rung the bell. Although not fully appreciated at the time, this was actually a highly significant moment in science. Boyle had shown that physical forces could be transmitted across a vacuum. Furthermore, he showed light can travel through a vacuum, because when air was pumped out of the jar, everything in the jar remained perfectly visible. Boyle also showed that air has weight, although this had previously been shown in 1644 by Evangelista Torricelli – and seems to have been known by Empedocles 2,100 years earlier in Ancient Greece. At the heart of Boyle’s ambition for chemistry lay once again Galileo’s idea that the world could be understood through mathematics. Boyle wished to turn chemistry into a quantitative science. Just as Galileo had rejected Aristotle’s theory of motion, Boyle now rejected the Aristotelian elements: earth, water, air and fire. He also rejected Paracelsus’s principles of salt, sulfur and mercury. Boyle correctly defined elements as simple substances that could not be decomposed into other substances. Compounds were produced when elements combined to form new substances, unlike mixtures in which no new substances formed. Having arrived at an excellent definition of an element, Boyle went on to say that he did not believe any true elements had yet been discovered. Unfortunately, he could not find an experimental method to prove whether a substance was an element or not, and he thought substances such as gold, silver and sulfur were actually compounds. Over a century would pass before Antoine Lavoisier could break through this experimental barrier and produce the first list of chemical elements. We think there is color, we think there is sweet, we think there is bitter, but in reality there are atoms and a void. Boyle agreed with this. Galileo and René Descartes also believed that all substances are made of atoms, but Descartes thought there could be no void. Boyle, however, had established from his own experiments that it was possible to have a void – a vacuum. As such, he was in complete agreement with Democritus. Boyle believed that chemistry – the behavior of substances – could be explained through the motion of atoms, which in turn could be understood through mechanics – Galileo’s mathematics of motion. Boyle was ultimately proved correct, because today we can understand chemistry mathematically, through quantum mechanics. Although he denounced mysticism, Boyle remained an alchemist, believing that one element could be transmuted into another. He thought, correctly, that this could be achieved through a rearrangement of the basic particles making up the element. This was first achieved by Ernest Rutherford in 1919 when he transformed nitrogen into oxygen. Influenced by Francis Bacon’s emphasis on drawing general conclusions only after you had amassed experimental data, then drawing on his own personal experiences in the laboratory, Boyle made a major contribution to the future of science by clearly laying out how experimental science should be done. Firstly, he had already made a clean break with the alchemists’ tradition of being secretive. Boyle openly published the results of his work. He warned that impure chemicals could cause errors in experiments, as could incorrect use of equipment. He explained how different people could honestly obtain very different results in an experiment, therefore experiments and their procedures needed to be carefully documented for others to see how they had been carried out. He emphasized the need to repeat experiments. He said that doing so improved experimental techniques, and if different results were obtained after an experiment was repeated, the reasons for this must be explored. He also implored people not to be disappointed if an experiment did not yield the hoped for results. He likened it to explorers who had been blown off course, only to discover new, unexpected regions. Heat was very poorly understood until the 1800s. In the 1700s it was associated with the behavior of a non-existent substance called caloric. Boyle, following in the footsteps of Galileo and Descartes, believed that heat is related to the movement of particles. In 1675 he offered a rather good description of the relationship between temperature and the movement of particles. In 1675 Boyle discovered that electric attraction operates in a vacuum. Although very wealthy, Boyle lived a relatively frugal, simple life, and was generous to other people. He was happy to spend large amounts of money on his experiments – he did not mind diminishing his wealth if by doing so he could learn some of Nature’s secrets. In 1660 Boyle was a founding member of the Royal Society, the oldest scientific society in existence. The Society, dedicated to learning Nature’s secrets by experiment, took the motto Nullus In Verba – Take Nobody’s Word For It! The motto owes much to Boyle’s preference for rational experiment over superstitions and the theoretical speculations of philosophers. Earlier scientists, William Gilbert especially, had also promoted this view. In 1668, aged 41, Boyle left Oxford to live in his older sister Katherine’s house in London. These were unusual times: two years earlier almost a quarter of the city’s population had died in the Great Plague and most of the inhabitants of the central ancient city had lost their homes in the Great Fire. Katherine was a significant person in London’s social and cultural scene. Boyle was not a very social person and he never married. Although, over the years, he received thousands of people into his laboratories with great hospitality, he preferred to work quietly on his own. He continued with scientific experiments after equipping a laboratory in his sister’s house. This was not so strange because, like Robert, Katherine was an alchemist. In 1670 Boyle suffered a rather severe stroke. In 1680 he was elected as the Royal Society’s president, but refused to accept the position because his devout religious beliefs prevented him swearing the presidential oath. Robert Boyle died of a stroke – or paralysis as it was then known – aged 64, on December 31, 1691, a week after the death of his sister Katherine. He was buried in a churchyard in Westminster, London. The churchyard was redeveloped in 1721 and Boyle’s remains were lost. "Robert Boyle." Famous Scientists. famousscientists.org. 2 Nov. 2015. Web. The Works … to which is Prefixed the Life of the Author.